Dogs and cats are highly intuitive, so disruptions in their daily schedules will make them wary. Stick to normal feeding times, walk times and bathroom breaks so your pet has some consistency. 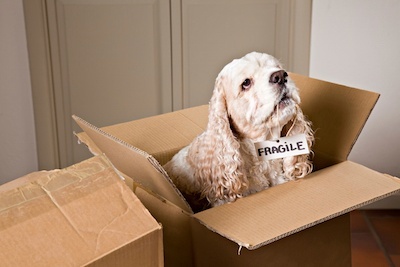 Place your pet in a separate room or crate while you're packing, and especially during the day of the actual move. If that's not possible or you think it would make your pet feel more uncomfortable, make arrangements for a friend or family member to care for them. At a time when your dog or cat is already trying to make sense of what's happening, imagine how that would add to his stress if he has to wait for his food dish or favorite toys to be unpacked. Have them easily accessible so you can get them out as soon as your pet gets to your new apartment home. It can be overwhelming for your pet to get used to your new home all at once. It may help to keep him in a separate room, just as you did prior to the move. Make sure he has his toys, bed and anything else he may need. After a day or two, let him explore the other rooms at his own pace. Even indoor pets can get away during the hustle and bustle of moving. Make sure your pet's tag has current contact information and update the records if your pet is microchipped or you use a tracking service. Check with local animal control to find out about licensing requirements and other corresponding regulations such as leash laws. With luxury amenities such as our leash-free pet exercise areas and pet spas, it won't take long before your four-legged friend feels right at home! Contact our Springs Apartments team if you have any questions.